Fiber optic connectors are unique in the sense that they do not provide mere terminations to the optical cables. In fact, these are also responsible for the flawless optical fiber connection that they deliver by aligning the microscopic glass fibers perfectly. The fiber optics is incomplete without the connectors that do the job of linking equipment or application to a fiber optic protocol. The design pattern of all fiber optic connectors is uniform and comprises of simplex and duplex. The simplex means one connector per end while duplex accepts two connectors on one end. You can dissect a fiber optic connector into three main parts – ferrule, coupling mechanism and main corrector body. The ferrule is designed to hold single strand of fiber. It is mostly made of ceramic, or a high quality plastic or any metal and is hollowed out at the center to offer better grip on the fiber. The connector body holds the fiber and attaches it to the jacket, thereby, increasing the strength of the fiber and its constituents. And the coupling mechanism determines the utility of the connector across various devices such as NIC, VCSEL or a switch etc. Coupling mechanism is one of the main factors you need to consider while buying a fiber optic connector. It can be a latch style or a bayonet nut style. 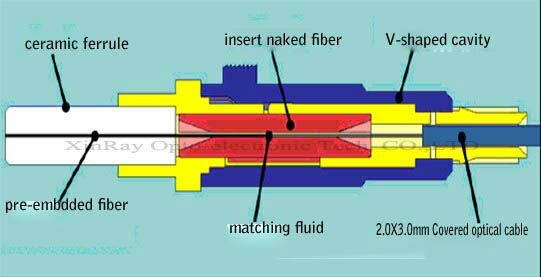 If you come across terms like ST, SC, LC, FC, MTP etc, you are actually reading stuff related to the fiber optics as all these terms are actually the types of optical fiber connectors. Some of these are made hybrid style too, where ST and SC and similarly other combinations are coupled to form a multi-utility connector relevant across different protocols. FC connector is screw-in type connector with 2.0mm narrow keys and maximum concentricity of 1 Micrometer. This connector is designed to complement high vibration working conditions. It also features ceramic ferrule that prevents backward reflections to a great extent. This connector is spring-loaded to offer ease of screwing into the port while minimizing the force that a fiber may experience. The CozlinkFC connector is also called PC connector as it enables direct physical contact of the surfaces of the two connecting fibers. It is one of the oldest connectors around and provided remarkable support to the single mode fiber networks. However, with the advancement of technology, it got replaced with SC and LC fiber connectors. An LC fiber connector is a cost-effective alternative to FC connector. It delivers exceptional density and is fully fit for the applications of all kinds. Ferrule is mostly ceramic type and insertion loss is minimal too. Compliant with IEC Specification 61754-20, this fiber connector offers reliable connectivity solution for 10G networks. LC connector with APC endface is considered the most efficient arrangement as the connection caused by angled fibers is quite tight and with minimal insertion loss. During the research and development, it was found that a straight connection comes with lots of setbacks, such as, insertion and return loss; and thus, require higher power budget management to achieve the desired outcomes. Setting the connectors at industry approved angle of 8 degrees help attain better connectivity and long-lasting performance. Thus, the APC fiber connector proves to be the better solution for enhancing the performance of the network. This, however, is made compatible with single mode fibers only and is suitable for long range networks complying withEthernet standards such as 10GBASE-LR, ER, XR, ZR and beyond. With MPO fiber optic connector, the fiber optics field can be said to have reached the acme of performance and durability. This connector is extremely handy and offers unmatchable ease of use. It offers amazing connectivity option for highly dense and well-aggregated networks and is designed to deliver 1000 mating cycles as compared to 500 mating cycles delivered by FC, ST and LC fiber optic connectors. Interestingly, MPO/MTP connector is the most affordable among all other connector types and has a plethora of benefits to offer to its user. MPO fiber optic connector is available in Push-on/Pull-off connectivity styles. It is larger than FC and LC fiber connector and offers support for 24 fibers in single ferrule. Thus, the networks comprising of optical connections of denser varieties are attainable with MPO/MTP connector. While others are suitable either for multimode or single mode fibers, the MPO adapter can accommodate both single mode and multi-mode fibers and are required to achieve highly dense networks. The networks are fast to deploy and on a ‘per fiber’ basis, the MPO fiber optic connector is relatively less expensive in cost. Three different MTP connection methods– Method A, Method B and Method C are approved as per TIA standards. Accordingly, Type A, Type B and Type C fiber patch cords are determined in the standard. These types are straight, reversed and flipped respectively. TIA entails the guidelines for duplex fiber patch cords to be used. This patch cable should be terminated with LC or SC connector. Alternatively, an SC to LC adapter can also be used to complete the connection. The end-to-end fiber connectivity is guaranteed by using either a cross version fiber patch cord or a straight-through variant. Method A: In this method, a type A MTP trunk cable forms connecting link between the MPO modules on the either side. A-A and A-B patch cords are essentially used to tackle the polarity issue in this case. Method B: This method makes use of type B (reverse) cables on each side of the connection.A Type B trunk cable links the two modules on both ends. Since fiber positions are reversed, the A-B patch cords are used to establish the connection at both sides of the link. Method C: The flipped fiber trunk cable connects the MPO adapter one each side of the MTP connections. A standard duplex A-to-B type fiber patch cords help achieve an effective fiber cable connection. Buying components for a reliable optical fiber connection is certainly not an easy task. You need to find in detail all about the connectors, their compatibility with different products and applications, and also the method to make the connection perfect on delivery and efficiency parameters. Refer to an MTP fiber connector guide to bring more clarity in the purchasing process and ensure cost-effectiveness in establishing high speed networks.